In this post, let’s see how you can build a coupon site on WordPress. If you’ve got something to sell, discount coupons are a great way to keep the cash resisters ringing. From penny-pinching moms to debt-laden students, most shoppers actively look for coupons that can lighten the burden on their wallets. Inserts in weekend newspapers have given way to websites offering discount coupons. 1. If you’re already operating a traffic heavy website, it makes sense to add a coupon section/page to your website directly. To augment your affiliate income, display coupons of third party products on your website. Visitors can click on the coupons and follow instructions to avail discounts. To create a coupons page or section on your website, you’ll need to create a custom post. If you’re unsure how to go about this, read up Karol’s earlier post on creating a custom post on WordPress. You can also use a plugin to add a simple coupon on any existing page (explained further below). 2. Or publish your coupons on a dedicated coupon website. You can host coupons of a single product, or use it as a common market place, hosting the coupons of a number of products or sellers as on RetailMeNot. In a dedicated coupon website, a customer can search for a particular discount voucher and use that code to get a discount or cashback on a retailer’s website. If you’re not sure which option is best for you, try building a dedicated coupon site or add coupons to your existing product page. Try a few options, to see what works best to help improve product conversion/affiliate income. Use of coupons increased by 32% in 2016 over the previous year. 38% used more coupons during 2016 as compared to the previous year. Over 50% (and 66% of millennials) in the study group expressed that they are more likely to shop online for groceries if they could use coupons. 35% of shoppers use print and digital coupon equally. If you need more data to convince you of the hike in use of coupons, you’ll find it in this post listing statistics from various sources. Major trends like these cannot be ignored if you’re serious about selling online. And if coupons are a major draw for online shoppers, maybe it’s time you started offering them too. Redirect search engines to the eCommerce portals. Form a loyal community of shoppers. Target promotions based on sensing mobile phone location and geo-fencing. Once you’ve signed up with a hosting service and installed WordPress on your website, you’ll need to find and install a theme. In case you’re looking for help on installing WordPress, look up Adelina’s post on creating a blog. You’ll need to choose and install a theme. There are a number of themes designed specifically for people who want to build a coupon site on WordPress. The theme you select must be capable of creating coupons and showcasing a catalog of coupons. Provided you find the right theme, adding the relevant information and publishing coupons should be a breeze. Advanced search using categories and filters. Category and store display for easy browsing. Coupon listing options such as top coupons, expiring coupons, date added, popular, featured. Registration, review and publishing of user submitted coupons. Contact form for customers and affiliates to contact you for deals. Subscription features and membership systems for exclusive deals and offers. Social sharing options and social login option. Countdown timers to build urgency for coupon expiry. Customized email templates for personalized offers. Tracking statistics, so you know how each coupon is faring. Provision for feedback from users. Option to hide your coupon and affiliate links. Some quality themes that come with most of these features are Couponer, Clipper and WordPress Coupon Theme. 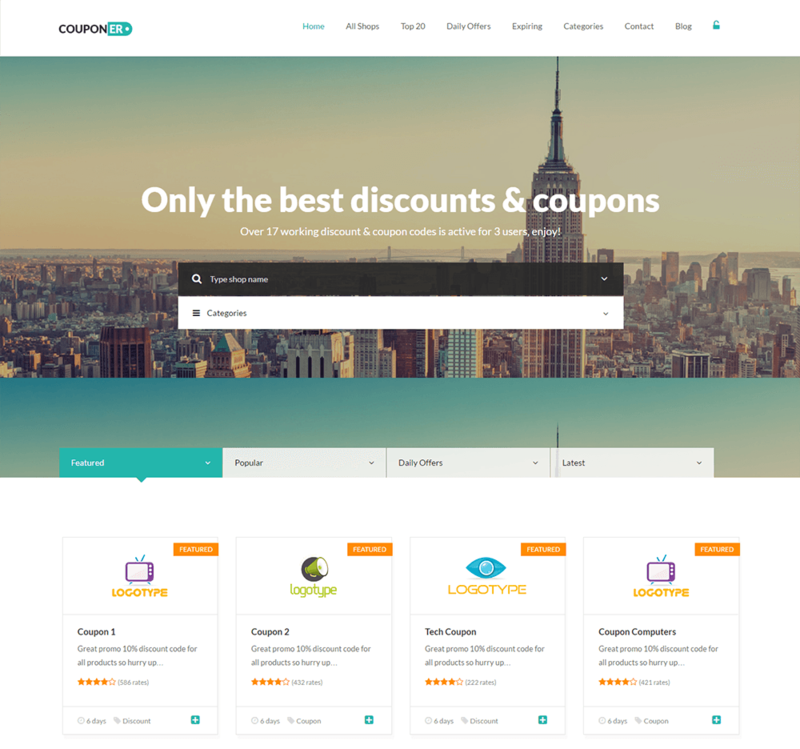 For example, Couponer is a top notch theme that can host coupons across multiple industries and allow users to search for coupons using filters. WordPress Coupon Theme, on the other hand, can help you build a search engine friendly coupon website on WordPress. Use of mobile devices is on the rise, as you can see in this infographic that appeared in Small Business Trends. You might also consider creating a mobile app for your coupons, a mobile app greatly increases your ability to provide personalized user experiences based on the user’s location. If you wish to add a simple coupon to your existing website, instead of trying to build a coupon site on WordPress from scratch, take the help of Coupon Creator or WPCoupons, two popular WordPress plugins. Download, install and activate Coupon Creator in your WordPress website. Once activated proceed to Coupons > Add New. Choose styling options, set expiry date and add links, category and images. Fill in all the coupon fields, save and publish. Select the Coupon Loop option and fill in the other options as well, select Insert Coupon and Publish. You’ll have as many coupons as you want. Figuring out how to build a coupon site on WordPress is just a start. You’ll need to promote it actively to make it successful. You’ll need to keep making improvements after observing performance for a while. Promoting via social platforms, personalized and regular email communication, allowing users to take advantage of coupons through mobile apps, and making coupons a part of your affiliate/product marketing strategy will go a long way to making your coupon website popular. Do you have any questions about coupons and how to build a coupon site on WordPress? Feel free to submit them in the comments section below.